Beta-carotene (vitamin A), vitamin C, vitamin K, vitamin E, folate, choline, calcium, magnesium, manganese, cooper, phosphorus, potassium, sodium, iron, vitamin B6, B-complex, tryptophan, molybdenum, protein & zinc. Many of you may be aware of the movie Fat, Sick & Nearly Dead. If not, I’ll give you a little background. The creator Joe Cross is sick and tired of taking steroids and other prescription medication because they have brought no success for his severe autoimmune disease, known as chronic urticaria. He decides to embark on a 60 day juice fast to get rid of the extra 100+ pounds, regain his health but more importantly allow the body to naturally heal itself. Throughout the 60 days he only consumes fresh fruit and vegetable juices. After his fast, he was able to lose all the excess weight, gain increase energy but more importanly reverse his autoimmune disease that he was dealing with for many years. The Mean Green Juice is one of the popular juice recipes featured in the film. So I created this green juice recipe as an enhanced version, still very tasty but loaded with more nutrients & minerals. This juice recipe features two types of kale. Kale contains many health benefits, such as, it’s rich in nutrients (contains antioxidant nutrients, anti-inflammatory nutrients & anti-cancer nutrients), which support the very hectic lives many of us live. I chose two types of kale to offer a full spectrum of nutrients, loaded with vitamin K, vitamin A (beta-carotene), vitamin C and more. Vitamin A: Protects you against infections. Helps boost the immune system. Prevents night blindness, prevents cataracts and preservers/improves your eyesight. Protects skin against sun damage and acne. Reverses signs of aging. Vitamin K: A critical nutrient for bone health and helps prevent osteoporosis. Helps prevent calcification in tissues and arteries. Vitamin C: Protects against immune system deficiencies, cardiovascular disease, lowers cholesterol & blood pressure, prevents strokes, prenatal health problems, eye disease and may help decrease the chances of gallstones. This mean green juice recipe alone will surpass your daily requirements of fruits/vegetables. Have you seen the movie Fat, Sick & Nearly Dead? Do you have any questions or comment? Post them below. 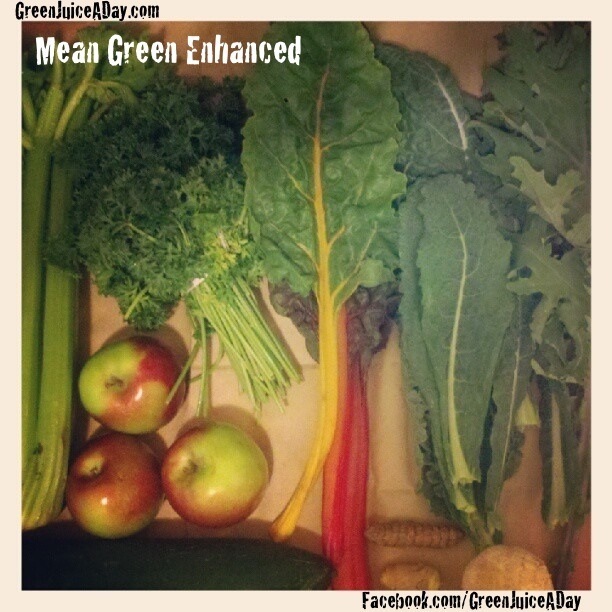 Make sure to like and share this mean green juice recipe with anyone you think will benefit. Ok so I am probably asking dumb question but you just put all of this stuff in an actual juicer and just drink the liquid what do you do with the leftover veggie pulp? I just asking because I do not have a juicer yet and wondered if a blender would work and just strain the liquid off ?? 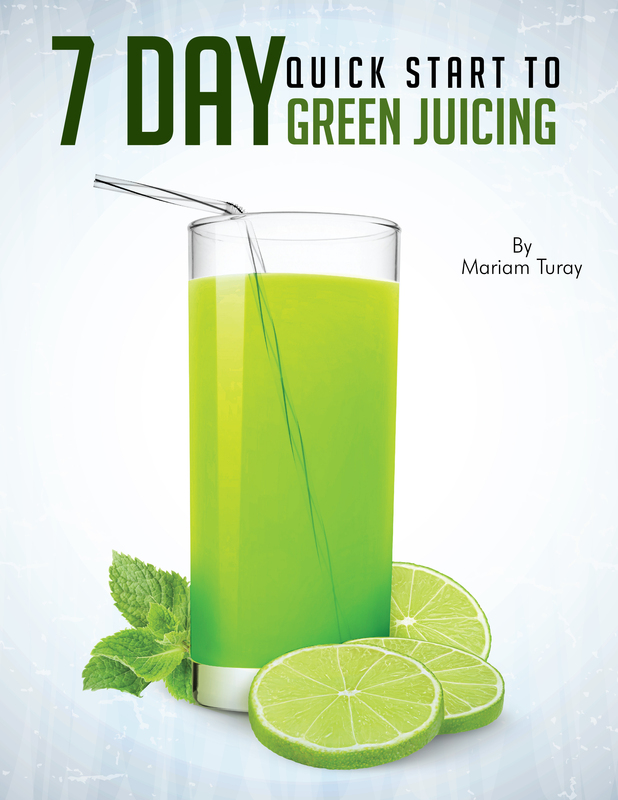 hi Mariam: I started juicing for the health benefits it offers. I have been juicing now for one week. My first two days was not to bad. Day three, four very tired, my tongue had white junk on it that was removed with a good brushing. I am beginning to feel some better. My goal is 21 days. Wish me well. Is this recipe for one person. In other words if I make this recipe do I drink all of it in one day? Since vitamins A, D, E and K are fat soluble (i.e. get absorbed when paired with fat). why is it you don't hear of juice recipes that include fat? I am new to juicing and have read about the dangers of juicing cruciferous veggies like collards, bok choy, kale and broccoli. I have seen many recipes calling for kale that I want to try, but I am now sceptical. Is the danger in using these veggies determined by the amount you use? Hello! I love your site! i am new to juicing, and would like to do the mean green juice fast. My body needs desperate cleansing, and I need to lose weight for my health. I want to change my lifestyle to a healthy one; I think this would be a great start. I’m going to start 10 days then, see how I feel, then keep going. How much juice do I make if I’m not eating? Big help : ) thank you! Thanks for checking my site out. Welcome. Organic spinach is a great substitute if you don’t have other greens available. Still very nutritious. The recipe makes 32oz. You can share that with him for 16oz each. 16oz is a great amount to start with per person. You can definitely increase along the way. Let me know if you have additional questions. great website. i just bought a hurom juicer and i am so excited and happy. Hi there. I just bought a juicer and I really want to do the cleanse but I’m afraid of being so hungry that I get sick or something go completly wrong like low blood sugar and passing out from hunger. 🙁 Also do I just fast with the same juice or do I try different juices throughout the fasting process? Thanks. The question you need to figure out is why do you want to do a cleanse or juice fast? If you’ve never done a juice fast or a juice cleanse, jumping into one isn’t the best idea. When you figure out why you want to do a cleanse, let me know and I can offer some solutions. Thanks for checking my site out. Welcome. Organic spinach is a great substitute if you don’t have other greens available. Still very nutritious. The recipe makes 32oz. You can share that with him for 16oz each. 16oz is a great amount to start with per person. You can definitely increase along the way. Let me know if you have additional quest. So I want to start juicing every morning for breakfast. I just finished a 3 day juice cleanse and I feel great! I want to do whatever gives me the most vitamins! Welcome 🙂 Thanks for becoming a subscriber and joining my newsletter. Congrats on your juice cleanse. Isn’t it amazing how you feel post juice cleanse. That’s an excellent idea, most definitely go for it. Sounds like you’re on the right track. Feel free to fill me in on your progress and let me know if you have additional questions along the way. I think I’m going to have to try this one next as an upgrade from the mean green. I love how you give all the nutritional info! Thanks Jackie, Let me know what you think. Here is one that I have been making, it yeilds about a gallon with my Omega 8006. I am new to juicing and wondering why you do with a gallon of juice. Does it keep for several days of do you just drink a gLlon a day? Hi Robert. I generally drink a quart (32oz) or two a day. Yields about 1 L or 32 ounces. Most of my recipes are about a quart of juice, I always suggest getting in at least a quart of green juice a day (You will fulfill your recommended serving of fruits and vegetables). You can break that down into two servings of 16 oz. If that is too much, just cut the recipes in half. Hi Jessica. I have my juices before a meal or in between. Allow at least 30 minutes after you drink your juice before you eat or wait 2 hours post meals to drink your juice.